The entire React Native Core Team in one room answering questions! Hi everyone! 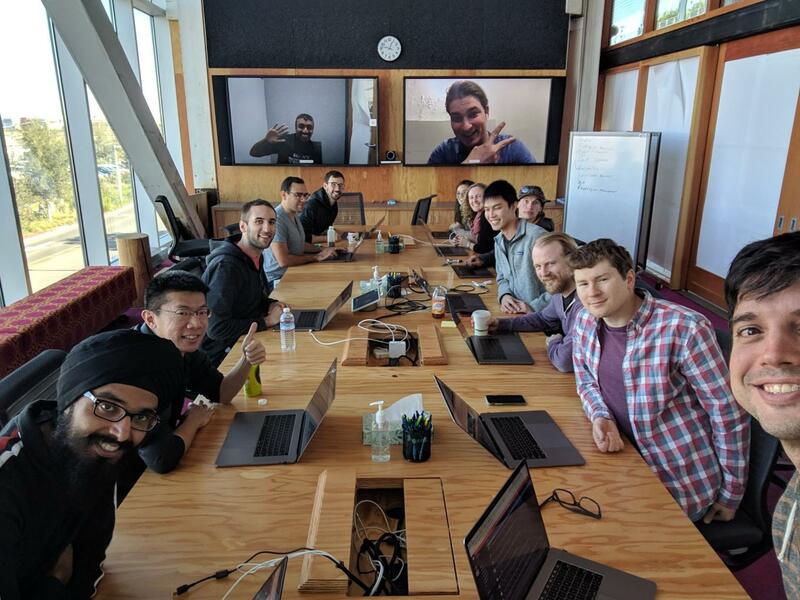 We are the React Native team at Facebook and are super excited to be here and answer questions. We’ve been hard at work re-architecting some of the fundamentals of React Native as well as trying to learn and improve some of the biggest pain points we hear from people in the community. One other link I want to plug is our discussions and proposals repo. I recommend watching this repo, we’ve been using it to discuss bigger changes to React Native and getting feedback from the community. Let’s jump in! Excited to answer your questions. A: We don’t have plans right now to move to TypeScript but recognize that it is super popular in the community. Right now we are working on improving the typing of our core components. I think this will also help the community improve the bindings for TypeScript. And to add to @EliWhite, Flow is important to FB and works well for us, so as long as React Native is tied to FB internals it’s not on the roadmap to switch. A: React is pretty amazing in that it can be used on so many platforms. It has been really awesome to see the communities around React Native come up. Things like VR, Windows, TV. Super awesome that people are finding so much value in the Platform that React Native provides and the pattern of building components from React. I think we are starting to see that people find the patterns in RN to be a great way to build web apps too. Twitter’s website (desktop and mobile-web) is built using React Native Web without using React Native on mobile at all. This multi platform approach is part of the reason React was invented in the first place so we are of course very excited about exploring this area more. I think React Native and Flutter have slightly different goals, so which one you use depends on what you are trying to accomplish. React Native skews toward leveraging each of the platform’s native capabilities. A: The latest React Native release, 0.58, is being propagated at the moment! You can follow the status for any upcoming release by joining the releases repository. After this release, we plan on going back to a more frequent release schedule, so 0.59 should not be long after that. A: If you ever encounter any bad error messages, please let us know by filing issues on the repository. Even better, send pull requests to improve the error messages. Related to this, today’s release, 0.58, includes a redesigned RedBox screen which was entirely driven by the community. A: We’ll enable Hooks on React Native as soon as there is a public release of React with them enabled. Hooks landed on React stable yesterday, so based on the RN release schedule, you can probably expect Hooks to land on React Native somewhere around the 0.60 release. A: Some amount of open issues is to be expected, but we’d certainly like for the number to be much lower than ~600. I am currently preparing a proposal for handling issues and PRs in a more timely manner, which I’ll be posting to the community proposals repository—hopefully we’ll get some good feedback from that, and get more people from the community involved in triaging issues and PRs. We’ll probably focus on getting the number of open PRs down, first. A: Yeah we hear you—community support is a key focus for us the first half of this year, @hector and @cpojer are all over it. A: Facebook is not leaving React Native—we are investing more in it every half and have big plans for the future, like Fabric! Facebook is not leaving RN. We’ve been heads down working on it for… years now. Check out Sophie’s post on the open source blog. A: There was a while back but we’re waiting for Fabric before working on Animated. Our overall plan is that Fabric’s API will allow better gesture handling along with better animations. re: Animated—@kmagiera has a couple awesome projects we are excited about and might pull into the core (react-native-gesture-handler, react-native-reanimated). We also need to get Animated working with Fabric which might require additional changes. Other than that, I’m not aware of any significant refactors planned for Animated. With Fabric we are thinking about some completely new animation API, but it’s unlikely that this work will be finished soon. For now Fabric will support the exiting animation APIs. A: We’d build what we’re building for Fabric. A: The best feature of Fabric is the ability for your application to be multi-threaded without application developers knowing about mutex, etc. Also, Fabric makes React Native more like React for the DOM in terms of interoperability. A: Yes, there will be asynchronous variants of most synchronous methods. But I think that synchronous by default will make the most sense in the long term, especially when people start making use of Suspense to provide instantaneous user feedback. To clarify, I’m referring to initial mount. I think that we’ll probably recommend applications use most asynchronous versions of most events (e.g. scroll, touches, etc). A: The Facebook app integrates into native navigation system that was built for the FB app as a whole, so yeah we do have internal native navigation abstraction for RN. It is quite specific to FB though. A: For small projects, you can spin up a node API connected to Firebase (can be REST or GraphQL) in a few hours, complete with auth and basic collections which is great for hacking on prototypes. There was a talk at React Conf on this that’s really good. A: With Fabric it will be easier to do deeper integrations with native APIs, and we’ll also have more oportunities to build deeper recycling, hittesting, and clipping optimizations built into the core. Once Fabric is out, we’ll probably revisit lists. A: I think the best way to learn is to build! There is a lot of great content regarding the React ecosystem but I found the best is to try and build something and then when you get stuck, finding a tutorial or example to work off from. I guess not React specific but generally good approach. For React specifically, I’ve found the docs really helpful and clear when I get confused about behaviour. To build on other’s answers, don’t feel like you need to learn the entire stack at once. Choose small pieces and gradually build up context. A: Actually ReactVR is basically that—React Native rendering to OpenGL. We’ve also thought about it from the context of 2D apps like Flutter, but it has never seemed like the right approach for many reasons, the main being that we want to build apps that look and feel like the native platform and we didn’t want to reimplement everything provided by the platform—it takes a ton of work and is very hard to keep up to date as platforms update their look and feel, including supporting multiple OS looks simultaneously so we can deploy to both new and old devices. Flutter has thrown a ton of resources at the problem and it’s unclear if the results will be worth the investment vs. the RN approach. A: Wow… double or triple team size, huh? Each of our major architectural projects could probably have slightly more aggressive timelines with 1 or 2 more people (mythical man month and all that). As I mentioned earlier about Flutter having really amazing tooling and documentation, I’d really want to invest in improving the developer experience and tooling for React Native. And last but not least, I’d invest in more aggressively growing adoption internally at Facebook. A: The RFC process is awesome. It really feels like we are empowering the community in new ways, as well as we have a space for longer form discussions about both technical and social aspects of the project. I’m happy to hear about your ideas on how we can improve the process. A: JSI is already out there in the repo. Fabric and TurboModules will release separately because their surface areas are vastly different. Concurrent React will need to wait until Fabric impl is complete. Welcome to FB! Marketplace is a huge user of React Native and they have a significant presence in our Seattle office. A: See @cpojer 's comment about using Metro for web….see if you can find where it’s used! @ericvicenti see my answer above. It is already used on a fairly large Facebook property on the web. Find it! A: we’re actively working on these projects, expect something stable to come along later this half. I used to work on the companion app for Oculus Go before joining the RN team, and there we wanted to hire some iOS/Android devs for all the custom stuff we wanted to do. But we made it for about 6-8 months before we did that. A: react-native-web is awesome, and we hired the author @necolas who is now also working on Instagram Web. We’re excited to make better use of it and continue supporting it. A: there are github issues for each of the big parts of the rearchitecture in our discussions and proposals repo. Thanks @kelset for organizing these links for us! A: we’ve tried a bunch of new ways to engage with the community over the last few months, from getting a bunch of contributions to Flow type our components (https://github.com/facebook/react-native/issues/22990) to deep dives like the twitch stream. I think we’ve fundamentally underestimated the interest people have in contributing and learning about the internals of React Native. This is super awesome to us and encourages us to do more of these things for sure. A: We have a few types of tests running internally: snapshot tests running continuously, unit and redbox tests running at diff time, Jest tests running at diff time, e2e tests…. The main issues we plan on addressing this half is improving the reliability of these tests, and bringing the internal and external testing frameworks closer together. This way, internal commits don’t silently break OSS tests and vise versa. About how we prioritize issues… it’s a delicate balance between issues raised by teams using React Native at Facebook, issues raised by the community, and investing in the future architecture for React and React Native. A: Fabric itself probably won’t help much with app load time unless you have a lot of custom native view managers, but we have a bunch of other stuff in the pipe that will help with startup time so stay tuned! A: My previous team encountered a similar problem when attempting to build a RN app. We ended up using react-native-web and slowly introduced new base components using View, Text. It still felt quite disjointed due to tooling and deploy but it was a great first step to build components that both web and mobile could share. pieces of turbomodules are already in master, check them out! Not all of them are there though, almost. A: profiling in production is important, we do it here at FB. There’s no way to simulate all the different devices and network connections that your app experiences in the wild. Some keys: be careful how much data you’re sending back, and how often a particular user is profiled. A: I use Expo + Atom but I want to out VS Code soon. I know it’s pretty boring answer. what other tooling were you thinking about? A: There’s a bunch of work around testing. I’ve been focussed on shoring up our internal snapshot tests. In OSS there’s been work around Detox, an e2e framework. A: I don’t know of anyone doing that in their projects. I wouldn’t feel great if that’s the solution people arrive at, I’d rather make sure the tooling is improved to make upgrades smoother. The CLI was recently forked to its own repository, https://github.com/react-native-community/react-native-cli, so now’s the time to send your contributions to improve the upgrade experience! A: does the F8 app count? I’ve built an app for myself that I use to track the TV shows I watch and when new episodes are coming. It lets me deep link into the show apps I have on my phone directly to the correct episode. It also includes a roku remote to control the tv. Pretty neat and useful for me. A: Everyone answering questions here is full-time on the React Native team. The real questions. Pikachu. But Wii Fit Trainer is starting to become my main.